The Infinity Crest Bath Filler T9905 is manufactured from solid brass with a stunning chrome finish. With a deck mounted design and 180mm pipe centres it is ideal for any standard two tap hole bath. 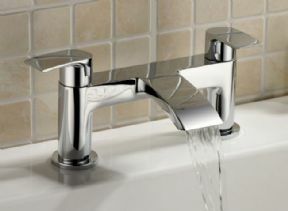 The handles are lever style for ease of use giving you full control to find the perfect water temperature to ensure you can bathe in a temperature of your choice. We recommend a minimum of 0.5 bar water pressure and are so confident in it's quality the bath tap also comes with a 10 year guarantee. Flow Rate: 0.5 bar at 11.9 litres/min, 1 bar at 19.9 litres/min, 3 bar at 39.2 litres/min.